Decks are a common and important feature of Australian homes whether the home is older and traditionally styled or contemporary. It’s easy to imagine a deck perched high over a slope or surrounding a Queenslander with good airflow and plenty space. But what happens when your house is low set and you want to have a deck for entertaining or to catch the best aspect for your early morning coffee? Don’t despair, suitable preparation can give you what you desire. Transition from paving to low decking can be seamless allowing for wheeled access. 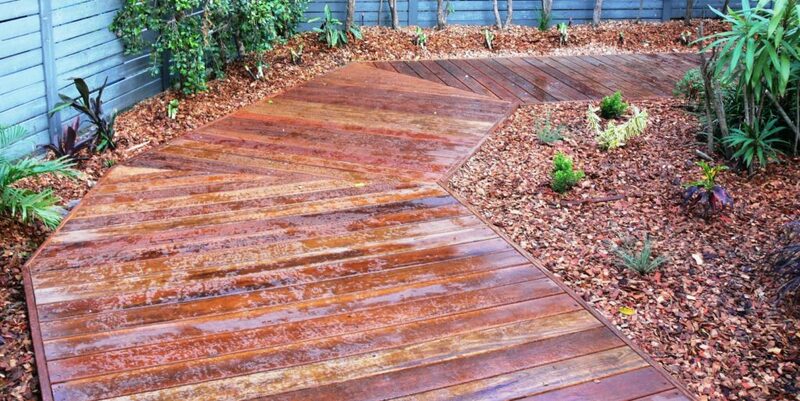 Low decking can also be a way to disguise drainage points in the garden. In order to build a low deck to last and not create other problems there are a few points to consider which don’t relate to higher decks. Ventilation will always be an issue. Correct choice of timbers to withstand regular dampness and contact with the ground must be made. These timbers should also be termite resistant or treated for in ground use (H4). Treatment with a water repellent preservative before construction will also reduce rotting or warping of the timbers. Thicker decking timbers are likely to last longer than the common thin ones. While they are more expensive and harder to install, the extended life of the deck will exceed your initial effort. Often excavation is required to set the deck at the right level. Grading the soil away from buildings will protect your asset. If this is not possible, pooling may develop under the deck which will need to be drained away. A pit connected to the stormwater system or slotted drainage pipe should be installed. A plastic membrane should be laid on the ground and covered with course sand or gravel to reduce moisture rising from the soil and to reduce vegetation growth. Finally, allow for termite inspection or barriers if the construction is adjacent to a house. Proper preparation will prevent deterioration and provide a beautiful boardwalk or deck for your garden. If you are seeking to have one made for your yard, be sure to talk to a qualified builder or landscaper. However, if you want to build your own low deck, contact Timber Queensland for technical advice.